In the past few weeks the first volume of the catalogue of the McCarthy collection has been published . The collection includes a series of 19 cuttings from a volume of Lives of Saints illuminated by the so-called Master of Monza, and the catalogue lists 27 more cuttings in other collections, making a total of 46. Two of the 46 should not be on this list, however, and two other ones should be. In 1901, Robert Forrer  published brief descriptions and images of nine cuttings which he had bought in Paris, which he attributed to a late 13th-century northern Spanish illuminator under Italian influence ("scheint nordspanischen Ursprunges zu sein, von einem von Italien beeinflussten Meister aus dem Ende des XIII. Jahrhunderts"). In 1974 at least 6 of Forrer's 9 cuttings were still together , and his attribution was still being accepted: northern Spain, late 13th century. In June 1991  a cutting passed through Sotheby's, attributed to northern Spain in the second half of the 13th century. 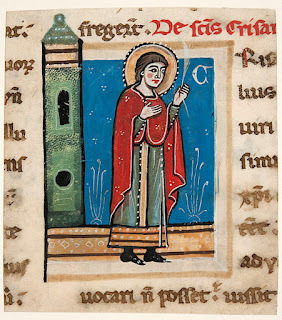 Later in 1992  two further cuttings from the series were being attributed by Les Enluminures to "the Master of the Beatus of San Andrés de Arroyo", and dated c.1225; an attribution that was repeated several times in the following years. In 1997 Giovanni Valagussa  showed that the series of cuttings were by the same illuminator as some initials in a choirbook in the Biblioteka Jagiellońska in Cracow. The choirbook is liturgically of the Ambrosian Rite, used in the archdiocese of Milan, and it includes the feast of Teodolinda, patron of Monza, just outside Milan, so Valagussa proposed that the artist was Lombard, not Spanish, and named him the Miniatore di Monza. By comparison with other works, he dated the illuminator's activity to c.1280-85. In 2013 Gaudenz Freuler  listed the 24 known loose cuttings by the illuminator, all from a Legenda aurea, and accepted that they were by the same artist as that of the Cracow choirbook (whose initials he did not list), and further suggesting the existence of "a further broken-up choirbook", of which only one cutting was known, in the Enrico Frascione collection in Florence. In 2011 I helped catalogue two cuttings in the Arcana collection, for their sale at Christie's , and observed that the text on their backs is from the collection of saints' lives by Bartholomew of Trent. 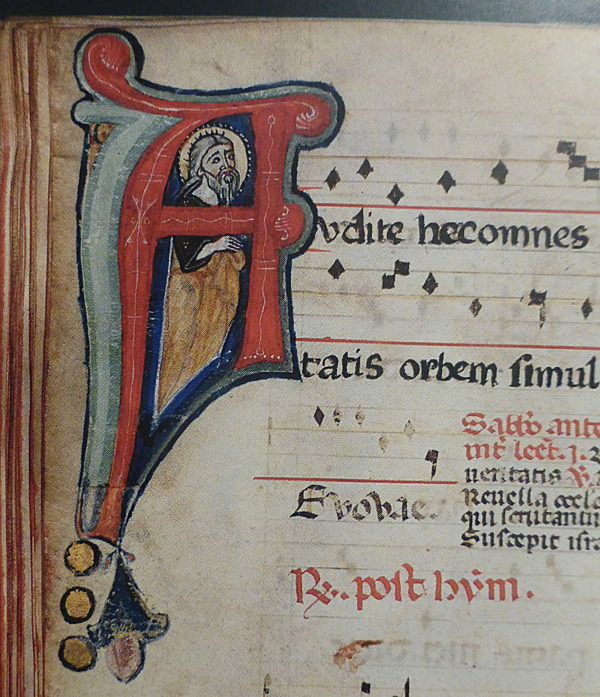 In 2016 I wrote a blog post in which I observed that the initials in the Cracow choirbook were not integral, but were pasted-in (I was unaware of the fact, as apparently were most other people who wrote about the cuttings, that this had already been noticed ). 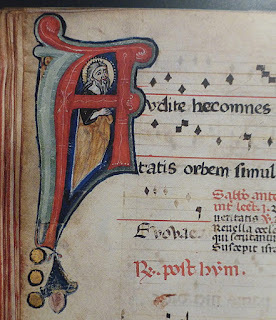 It follows from this that the date and localisation of the choirbook is perhaps unrelated to the date and localisation of the illuminated initials. I also suggested that the choirbook cuttings are from the same series as the loose cuttings of saints, and that a loose cutting in the Frascione collection (which I have not seen) is also probably from the same series, and not from "a further broken-up choirbook". The number of known volumes to which the artist contributed was therefore reduced from three, to one: all the known initials and miniatures are probably from a single illuminated collection of saints' lives. that while the manuscript from which the cuttings come must post-date the canonisation in 1228 of St Francis (who is depicted in one of the cuttings), it might pre-date the c.1266-70 publication of Jacobus da Voragine's Legenda aurea, as his text derived, at least in part, from the earlier work of Bartholomew of Trent, completed in 1244.
that even if the manuscript was made it Italy, the illuminator might have been Spanish, perhaps an itinerant Dominican (both Bartholomew of Trent and Jacobus da Voragine were Dominican). If this last hypothesis is true, then it would mean that Robert Forrer had accurately attributed the style of illumination as far back as 1901! In the next post I will address the issue of the corpus of cuttings that can be attributed to our artist. The manuscript itself is unadorned. All the initials contained in it were barbarically cut along the outer contours of some undoubtedly Lombard manuscript, dating back to around 1300, and glued in those places where the needs of the antifonary text required it. G. Freuler and G. Parpulov, The McCarthy Collection Vol I: Italian and Byzantine Miniatures (London, 2018). Robert Forrer, Unedierte Federzeichnungen, Miniaturen und Initialen des Mittelalters (1901). I only have access to the 1902 edition of this volume, in which the cuttings are on pp. 15-16 and pls. VI-VIII, but Freuler (above, and 8 below), Valagussa (see 7 below) and de Hamel (see 10 below) all cite a 1901 edition, pp. 11-12 and pls. VI-VIII. Maggs Bros Ltd, European Bulletin no. 18 (London, 1974), nos. 1-6. Sotheby's, 18 June 1991, lot 10. Sotheby's, 23 June 1991, lot 28. Les Enluminures, Catalogue 1 (Paris, 1992), nos. 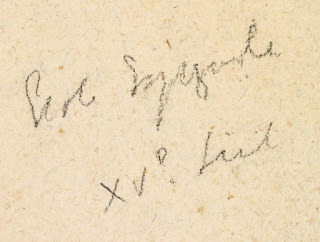 18a, b.
 G. Valagussa, “Santi lombardi di fine duecento”, Scritti per l’istituto germanico di Storia dell’Arte di Firenze (Florence, 1997), pp. 23-34. G. Freuler, Italian Miniatures: From the Twelfth to the Sixteenth Centuries (Milan, 2013), no. 40. Christie's, Arcana sale part III, 6 July 2011, lots 2-3. A. Sobańska, "Antiphonary of the Ambrosian Liturgy", in The Jagiellonian Library: A Bibliophile's Treasure House (Kraow, 2011), cat. no. 8. C. de Hamel, The Medieval World at our Fingertips: Manuscript Illuminations from the Collection of Sandra Hindman (Chicago, 2018), cat. no. 3. Z. Ameisenowa, Rękopisy i pierwodruki iluminowane Biblioteki Jagiellońskiej (Kraków, 1958), no. 6.